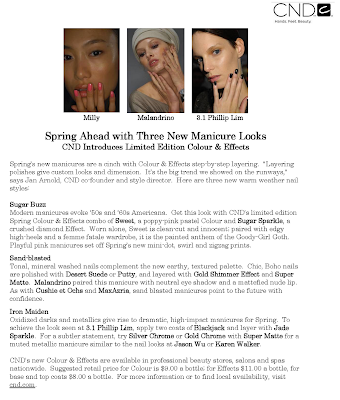 CND, a company that has reinvented their nail polish, sent out this release on their 3 new manicure looks - please click the picture to read it better. These will be made available in either March or April 2010. CND is available for $9 per colour, and $11 per effect and you can find locations to buy here. TransDesign and Head2ToeBeauty has the colours for $4.50 and effects for $5.50. When I did my post on this a week or so ago I didn't realize at the time that Nailtini also has a shimmer polish like CND's Sugar Buzz named Sugar Rim that's similar. Heck they have all of the topcoats similar to CND. CND is more reasonably priced though. The Phillip Lim combo is so his likeness, really makes me think of his awesome NY Fashion Night Out leather jacket. Oh awesome! I'm still branching out to new polishes -- so thank you for telling me about your post on Nailtini!